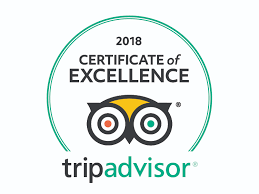 We are pleased to announce that TripAdvisor has awarded Village by the Sea its 2018 Certificate of Excellence and announced that it has also qualified for TripAdvisor’s Certificate of Excellence Hall of Fame. The Certificate of Excellence recognizes businesses that earn consistently great user reviews and reflects an “exemplary year of customer service to” its guests. • Have been listed on TripAdvisor for at least twelve months. Recipients are announced only once a year in late May.